I’m an Atlanta native, Summerhill homeowner, and lifelong Braves fan. This is my culmination of articles and figures on the move to Cobb as well as an urgent plea to the Braves organization and City of Atlanta to rethink the ripple impact of the sudden decision. 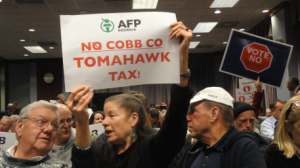 On Tuesday, November 26, 2013 Commissioners will vote to continue the plan to move to Cobb. Two weeks ago I awoke in bed to texts and “Breaking News” notifications on my phone. What was being said was a dream – a nightmare. I was sure of it. And then I heard it directly from the Braves’ President. My Atlanta Falcons the day prior had just fallen 33-10 to the Seattle Seahawks at the Dome and I was certain the fate of my Atlanta Sports teams couldn’t quite possibly be worsened with news of such magnitude – in the off season. Having grown up in Atlanta during the early 90s, all my life there were few things as child I remembered getting truly excited about in my city other than baseball and the Atlanta Braves. My parents, Indian immigrants, knew I was always into sports. My father admitted he couldn’t explain to me what was occurring on-field during any American Football game, and took me to then, Atlanta-Fulton County Stadium. After all, America’s favorite past time shared similarities with India’s most popular sport, cricket. It was that simple. I was in love. After all, what wasn’t to love? The worst-to-first squad, our mound aces, and of course our hall-of-fame manager. Players were traded, friends would move, girls would come and go – but the Atlanta Braves were always the rock. 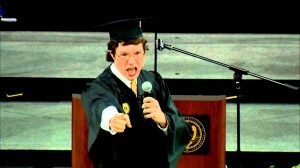 A team with a rich history, always on the Superstation, and fostered on the ideals of Ted Turner. Privileged to be born during the expansive season, I have annually celebrated my Birthday among friends at Turner Field, rooting for the team “in my backyard”. Initial reports and comments from Atlanta Mayor Kasim Reed the day following the Braves announcement infuriated me. In 2017, the city would demolish Turner Field and all of the history along with it. When Braves President John Schuerholz was questioned at the November 11 Press Conference regarding what would become of the memorials, his answer was elusive – it hadn’t been considered. In the early 90s before the Olympics put Atlanta on the map, before the Georgia Aquarium and Centennial Park’s downtown presence, family friends and visitors would flock to Atlanta and inquire what there was to do in the Southeast’s capital. As a kid, weekends entertaining guests consisted of few things – a trip to the outlets, getting sugared up tasting soda at the Underground Coke Museum, a trip to the home of the Braves, and Stone Mountain for the laser show. The Atlanta Business Chronicle’s list of Top 50 Atlanta Landmarks includes both Turner Field, and Stone Mountain for their historic value as monuments and Olympic history. To me, the immediate area surrounding Turner Field is as much a monument to the game of baseball and all that is sport, as Stone Mountain for its respective history. While not physically possible, one would never consider relocating this monument because of its specific location for its historical significance. Before Turner Field was constructed, there was a great deal of concern and conversation as to what would become of the area where Hank Aaron’s historic 715 Home Run was hit. 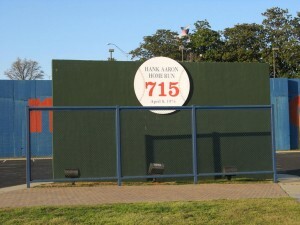 Careful consideration to how the city would continue to honor and embrace Baseball’s Homerun King. The outline of the Atlanta-Fulton County Stadium, similarly taken into account to commemorate the Braves home for so many years just across the street. My dad and I still like to go real early to the Ted and park in the second row of white lines in the green lot – right where our seats were at Atlanta-Fulton County Stadium. Serving as an Olympic host for the Centennial games was undoubtedly what put Atlanta on the map of the world and led to its growth as a top-tier global city. Think of all the Olympic Stadiums that have been used globally. Dating all the way back to 1896, only one stadium (London) has been demolished. I would hate to think Turner Field would want to set the trend on this list. The problem is visitors and those who don’t know better already think the torch outside the Varsity on North-Avenue is the same cauldron Mohammad Ali ceremoniously lit that day in 1996. A departure and demolishing of Turner Field would only further that belief. Last week I was privileged to attend the week’s top Football match up (Stanford at USC) at the Coliseum in the other US city host, Los Angeles. The venue was not the newest in character, but just for a minute you get that eerie feeling of being among the greatest athletes in the world. The city of Los Angeles also continues to use this as an event space for festivals, concerts and other large-scale gatherings while the city and other investors and its inhabitants maintain the upkeep. Looking for ways to invest in my team beyond purchasing tickets, I invested in what I was led to believe would my permanent appreciation and stake in the Braves organization with the Braves’ Legacy Brick Paver Program. 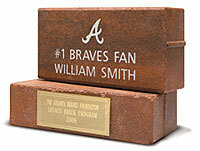 What becomes of my brick, a “permanent part of Turner Field,” along with 1000s of others? I can’t help but feel cheated by the Braves organization for raising funds for a tangible item with a solidified history and no intent to uphold its timeless value. To develop a plan with renderings, financial figures and stakeholders for a move out of the city of Atlanta, but have no plan on how critical landmarks and monuments will be handled is shortsighted. When I graduated college and decided to stay in Atlanta, I made a decision to invest in the Braves the only other way I knew how. After weighing the benefits of other neighborhoods, I became a homeowner in the area surrounding Turner Field, Summerhill. An up and coming neighborhood where I feel safe walking at nights and have wonderfully diverse neighbors. We have had our share of car thefts from kids when cars are left unlocked overnight, and the areas around do feature a number of abandoned shops, but the neighborhood is drastically different compared to a year ago. While my above analogy to the ‘largest exposed piece of granite’ somewhat cheeky, my comparison with regards to its neighborhoods and businesses in the immediate vicinity isn’t. The neighborhoods of Summerhill, Peoplestown, and Mechanicsville surrounding Turner Field are arguably impacted more than anyone. 11 Alive Doug Richards Raised questions about millions spent in the troubled areas surrounding Turner Field. Local neighborhood groups like the Organized Neighbors of Summerhill are doing everything in their power to try on their own to revive the areas and communities themselves. After hardships and corruption, our neighborhoods are finally seeing positive change. With an interest in Summerhill’s history, and having interest in my developing neighborhood and community, I regularly attended the meetings held with Zone 3 and 6 police, councilmen, and the Atlanta Braves. I specifically remember attending a meeting in the 755 Club during the summer in which the Braves brought up their desire to bring a mix-use live/work/play development to Turner Field in 2016 when their lease expired. They assured residents that they had as much a vested interest in the community, its parking structures and safety of its residents. I feel foolish knowing now that that was a time-filler as a room of roughly 100 were filled with Coca-Cola products and merely sent back home. [The Braves] assured residents that they had as much a vested interest in the community, its parking structures and safety of its residents. CNN recently reported on the number of local-NPO LIVING WALLS’ murals that were just installed over the graffiti-laden walls of abandoned storefronts along Georgia Avenue. Though businesses like Boners BBQ have departed the neighborhood because of their overhead during offseason months, there is hope for other thriving businesses in a larger developmental plan such as those discussed by the Braves as recently as July. 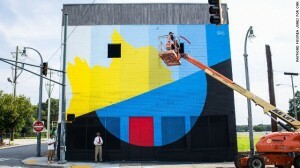 Atlanta magazine captures the essence of the areas solvable problems in their June feature, The Other 284 days. Residents of the neighborhood rely on the Braves games and its patrons business to survive. My immediate neighbor (legitimately) owns several of the adjacent lots to the ballpark and is a city homeowner who will lose his ability to earn an income from those lots if left vacant for any period of time. Residents of Summerhill and surrounding neighborhoods can’t help but feel abandoned by the Braves and helpless when we have been promised plans for a mixed use space for our community for years. Once you move passed all the baseball cliches and national news attention this issue has received, the underlying cause of frustration for many fans and residents has to be that the decision has unexpectedly come without ample feedback from all stakeholders involved. Any time you have three meetings a day before a scheduled vote where the attendees outnumber the seats available, it seems only logical that these voices be heard in an appropriate forum. Last week, Cobb county released their Memorandum of Understanding, that has only been viewed just over 1500 times on Scribd. I have to think, this is only a fraction of those who may be impacted in Cobb by the move and may desire a greater understanding of its affect. Ted Turner’s reaction on the Braves move to Cobb evidently came as a surprise to even him. I am very curious where Bobby Cox, Chipper Jones, or even Hammerin’ Hank stand on the matter. After all, this is the home that they built. This is their legacy as much as it is the fans’ or organization. Posts on the Braves’ social media accounts in the previous two weeks have been hijacked with comments regarding the team’s move. Comments have outweighed ones even relevant to the post and the Braves have even removed posts that got out of hand and left sight of its content – one honoring our troops. This issue perpetuates one thing – the polarization of a city and metro area already divided. This issue perpetuates one thing – the polarization of a city and metro Atlanta already divided. Turner Field is something that will always be special. My father introduced me to it, I was able to cheer alongside my fellow friends and peers, and I’ve been privileged to introduce the Turner Field experience with a new generation of fans. The Atlanta Braves are a tradition – and so is remaining at its downtown home. While at Georgia Tech, attending Braves games were a natural reprieve where I would also break bread with peers from Athens over an evening at the Ted. As a graduating senior at Georgia Tech, all programs require a project-based case study working to solve a real issue utilizing out-of-the-box thinking and presenting solutions to real clients. If the faith isn’t in the talented students coming out of our top-ranked programs, offer the opportunity for the community who has a vested interest in the team. Atlanta is a Top 10 city in the thriving startup scene and its culture is one that fosters out of the box and innovative thinking. I urge the Braves to show good faith in their desire to remain in Atlanta and offer an incentive for those who may be able to pose viable solutions to consider minimizing the city’s financial contribution while mending many of the problems standing in the way of the Braves remaining at Turner Field. In a recent October Interview with Mayor Reed on Startup Culture in Atlanta, he stated “We’re trying to build a culture in Atlanta so that when people come here, they stay.” Then again I guess his philosophy doesn’t apply to all things. Where many people reserve Sunday to attend church and tend to their religion, a long time ago, I came to realize Turner Field is my church. The Atlanta Braves are my religion. There is nothing more relaxing and centering than a Sunday afternoon at Turner Field. I came to realize Turner Field is my church. The Atlanta Braves are my religion. 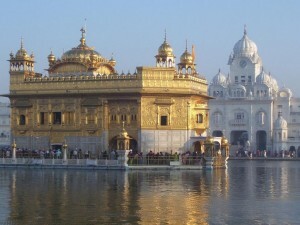 On a family trip as a child to the state of Punjab in India, I insisted we visit the Golden Temple, a place of worship for one of India’s most prominent religions, Sikhism. Everyone regardless of color, class or creed are welcome to visit and partake in the temple’s grandeur. What was most impressionable to me was the loyal service and volunteer efforts all visitors partook in while there. Everyone is fed a meal, or langaar, but the cooking and cleaning, repairing and assistance are all performed as donations and service. Their captains of industry are making the temple more efficient by sharing their best business practices such as solar cooking and working together for the benefit of the organization. Just as I would volunteer my time to improve the grounds on my campus or personal organizations, why not see what of the stated $150mil can be completed with sponsorship, sales or even service efforts. Getting the surrounding community and businesses involved in a concerted and organized effort is the first step to making the area more desirable to be around. For the Braves to not be open to negotiation with parties in the city or surrounding area and make their decision in a metaphorical vacuum is unfortunate. Perhaps my suggestions are viewed as overly optimistic millennial musings, and that might be true. But, while I can’t speak on behalf of all Braves fans for willing to contribute in any way they can – there has not even been an opportunity or chance. There has been a lot of talk regarding the class disparities and citing the racial demographics of Atlanta as culprit for the Braves move. Baseball is a Business. I get it, but I bought into the Braves and now they’re selling out. John Schuerholz himself can’t disagree with this statement. Anyone who has picked up his book, “Built To Win” (as I did and had autographed in 2007), expecting it to be about great trades and the makeups of some of the best negotiations of baseball, you will find nothing further from it. He discusses his ability to capitalize on naming rights, sponsorships and other decisions that certainly were more profitable for the organization. I get it. Baseball is a Business. Why wouldn’t it pay top dollar for the best? Because that’s not the Braves. I have always prided myself as a Braves fan because we have been able to always do the most with the least. The Braves have always been able to get production from our farm system and ‘homegrow’ our players that then make their way to the Big leagues. It’s how we have consistently had a winning ballclub capable of competing with the high-salary rosters of some of our AL counterparts. Smart offseason moves have led to big players down the line and a move to Cobb isn’t one of them. Some of the best (and smallest) things about Turner Field are definitely some of my favorites, and things that Ted Turner instilled when he bought the team. He envisioned a place that anyone regardless of income level would be able to come to the ballpark to enjoy a game and root on the Atlanta Braves. He offered specials for coming early and even permitted you to bring in your own food to the ballpark so that wouldn’t hinder a family from attending. I respected this, and fear these foundational beliefs the Braves I grew up with will be lost in a Cobb move. The maps the Braves site has been using to justify the move has been one that illustrates where their season ticket holders are. 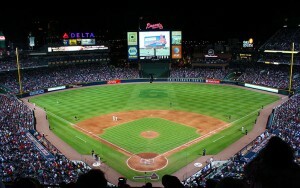 Majority of Braves home games are played on weeknights. As a followup survey, wouldn’t seeing potentially where most of those that actually attend games work at? Many season ticket holders end up giving their tickets away to colleagues, clients or flat out not going. While this may change with the Cobb move, who’s to say that it also won’t also impact those from the move downtown? How can a stadium being torn down and abandoned after 20 years because of its insufficiency sign a contract to host a team that is paid out over 30 years? Is there not a potential here for another change? 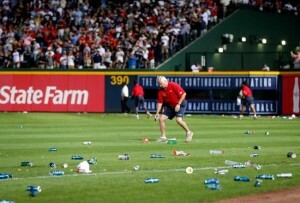 A recent article shows the current state of Turner Field sarcastically as abysmal. The figure of $150 million provided by the Braves and stated as necessary to update Turner Field has yet to be outlined. Who’s to say where that figure actually is. 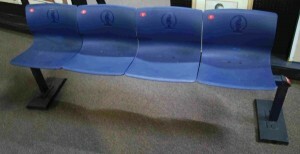 In fact, there are discussions that even with the move, Turner Field would still need repairs. Where is funding for that coming from? Is Atlanta tax payer money to go to a stadium that no longer plays host to a team? So if we’ve established it’s about a need for funds, how about we raise it. As a city. In 1996 when Centennial Olympic Stadium became Turner Field, the seats were auctioned as sets of four available for purchase. Ours remains an integral part of our memorabilia collection in our basement. If the desire is to no longer make Turner Field a Top 5 ballpark in terms of seating capacity because of the inability to fill it, why not do the same thing along with a litany of other cherished items Atlanta fans nationally would clamor over. While it may not raise $150mil, it sure is a beginning for discussions on creative ideas for maintaining an Atlanta landmark. New year-round opportunities to host events along with the expansion of sponsorship opportunities not only assist in funding the necessary additions and repairs, but also create new jobs and additional revenue avenues. Is this not something the city should at the least briefly entertain? Today, the initial dust has settled, and overshadowing the fact that Joe, Skip and Pete will no longer be announcing the names of Tim Hudson and Brian McCann in 2014, has been that the Braves are chopping to Cobb. This evening despite tremendous opposition, Cobb Commissioners will vote to progress the deal that will take “America’s Team” outside the Perimeter in 2017. In the frenzy, Cobb advocates have taken to a bit of bribery by offering up a pair of 2017 Season Tickets to those that email their commissioners using an online site using a cleverly purchased domain. It gets worse, Cobb has already scheduled a victory party at the Earl Smith Strand Theatre tonight given 3 of their 5 commissioners are locks on “YES”. To say that Braves fans aren’t passionate or emotional about their team is a joke. Don’t get it? Dare we reference that unfortunate Friday evening of October 5th, 2012?